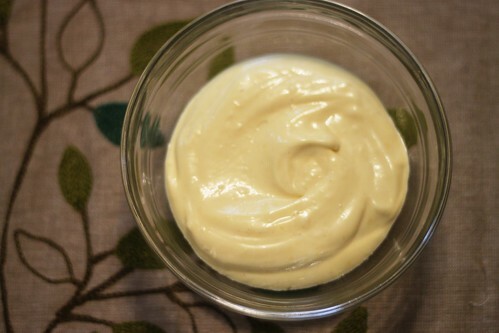 Use this basic mayonnaise recipe to make a big batch of homemade mayo for all different dishes. Mayonnaise is something so easily bought from the supermarket. Why go through all the fuss and make it by hand? Have you seen a food label on a mayonnaise jar lately? It contains all sorts of chemicals and preservatives I can't even pronounce. Stuff like sodium benzoate, calcium disodium EDTA. How about vague terms like natural flavors and natural colors? What about stuff like modified corn starch, high fructose corn syrup, xanthum gum, phosphoric acid, lactic acid? None of these things appear in homemade mayonnaise so stop putting unnecessary substances into your body especially when it is something that can be quite easily and quickly whipped up. Fresh and natural ingredients meant healthy good eats. Homemade mayo also tasted much better than store-bought ones. The texture is creamy and more earthy. Most people complained about how hard it is to get the egg and oil to emulsify. Read How To Make Mayonnaise for some great tips on how to make your homemade mayo a success. This recipe makes quite a huge batch. If you are only making it for personal consumption, reduce the portion accordingly. The next time you go to a cook-out or picnic, whip up some homemade mayo, I'm sure whoever is eating with you will appreciate it. I hope you will try this basic mayonnaise recipe and let me know how it went.